Hi friends! How are you? Long time no post! I've been pretty busy with real life stuff lately but I wanted to share one last pumpkin themed recipe with you all! Since tomorrow is Thanksgiving for all of us Americans, I spent a long time in the kitchen and grocery store today and loved every second of it! (Except doing dishes, that's definitely not something that I love.) You can check out more of what I made and am going to eat tomorrow on my Instagram! I want to see what you guys make too so tag me in all of your goodies and we can be excited about it together. Woo! On to these Chocolate Pumpkin Truffles... So I had a bunch of cashews soaking overnight to use in this recipe. Well Roxy, my dog, must have gotten hungry and ate about 2 cups of cashews. Such a bad dog! I had no more cashews so I had to compromise and added in some other nuts and seeds. Totally made it work! Creamy pumpkin center, chocolate, and a gooey date sauce combined together for a perfect fall treat! Let's get to it. Combine all ingredients in your blender or food processor. Blend together ingredients until smooth. Scoop out medium sized balls on parchment paper lined cookie sheets. Place in freezer for 1 hour. Mix together ingredients. 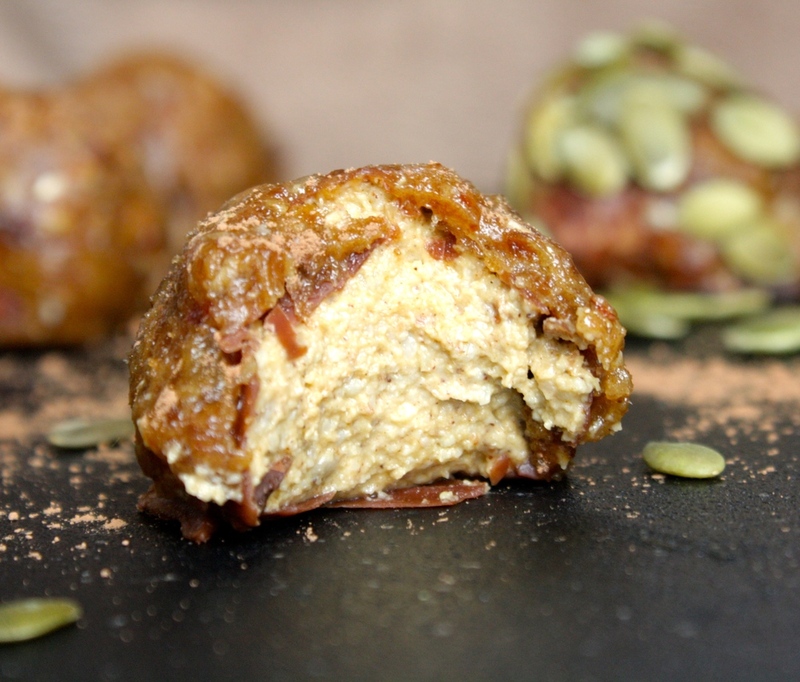 Remove pumpkin balls from freezer and coat with chocolate. Place on parchment paper and put back in freezer. Blend together all ingredients in blender or food processor. Remove chocolate pumpkin balls from freezer and coat with date mixture. Roll in pumpkin seeds or top with cacao powder if desired. Serve, enjoy!